How to Fix and Alter your Hats, Scarves and Clothing to Fit You- Tea Couturier Reporting. Scarves and hats can be very hard to fit over hair in SL. 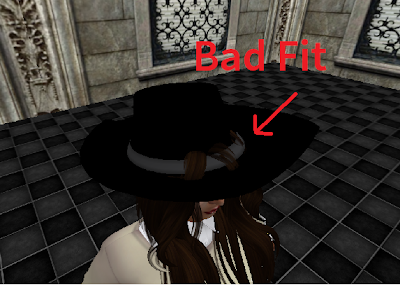 If you have your own hair peeking out of the hat, it either looks small for your head too big when you try to modify it. That is IF you are able to modify them. Here are a few of my tips on getting that right look that fits. 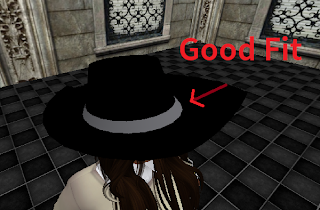 In Second Life it is best if you are going to wear a hat to get one with a menu that has a resizable script in it. Most clothing and accessories have some type of menu which enables you to adjust them to fit you. This is a good starting point. Some menus have restore back to shop size, this again is helpful if you mess up you can just click this button and it will restore it to how you bought it. My tip is to wear the hat and see how it looks under your hair. 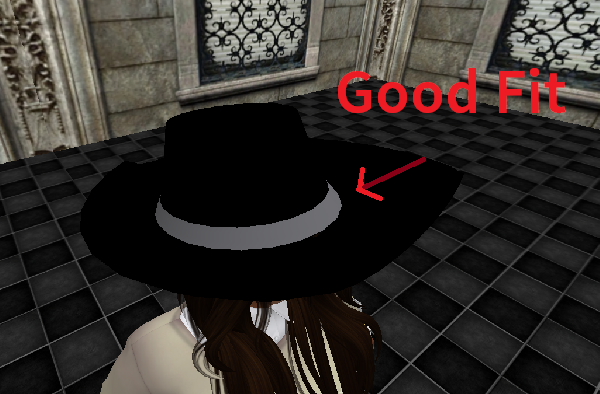 Then touch the hat or right click and a menu should appear at the corner of your screen (on the right hand side). Using baby steps, increase the hat size slowly. You should have an option of +1 +5 -1 or -5. (+) being increase in size while (–) being decrease in size. If the hat is too small click +1 and then spin the camera around yourself to see if it begins to fit the way you want it to look. Try to avoid your hair or scalp showing. Keep increasing by +1 as this helps to keep a check on the size of the hat and also helps to keep control on how big it gets. Keep doing this until it fits to your desired size. Once you are happy with the fit, click close menu and the size will stay like this until you change it. Don’t forget if you make a mistake by increasing the size too much either click -1 button till it decreases, or hit restore to start again. 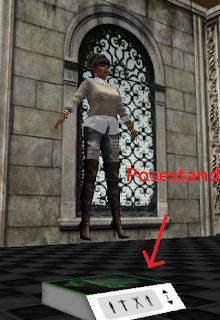 I would suggest that either of these methods are done on a pose stand to stop avatar movement. This process can also apply to scarves and other modifiable accessories you wear. If the accessory does not have a menu but you are allowed to modify it and copy it. I would suggest if you make a copy first and then resize with the copy. That way, you will have a backup just in case. Again sit on your pose stand. 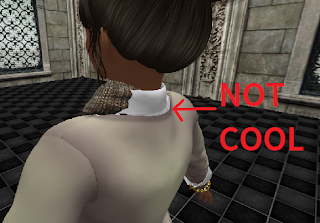 If you don’t own one, you can get one free on the SL Marketplace. 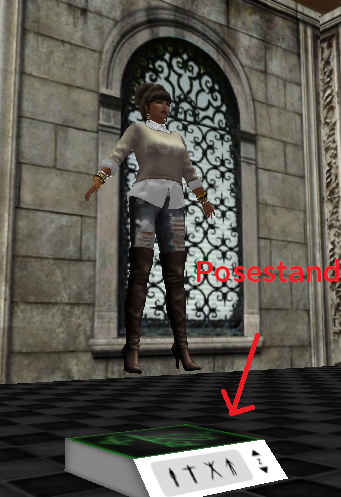 Now that you are situated on your pose stand, whilst wearing the hat, scarf or article of clothing, click on edit and look for increase in size. Again, work slowly pulling it at each end to keep the shape. Once you cannot see any hair, skin or scalp then I would say stop, even if it just a little bit peeking through to avoid losing the shape or making it too unrealistic in size. Sometimes it is impossible to achieve a perfect fit. The best solution for hats if you do not want to fiddle with fixing and resizing is to buy a hat that has hair already attached. You can get some lovely designs to match your hair color and it will save on time and energy because the hat will naturally fit the hair that is already attached. 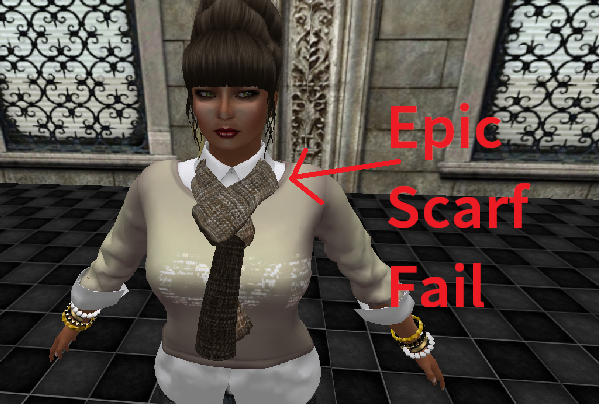 With scarfs it is basically the same procedure making sure the scarf fits around your whole neck. However, with scarves you really do not need to worry if it has no menu options to adjust it. Simply sit on your pose stand whilst wearing the copy of the scarf you wish to wear and edit. Then right click on the scarf to edit it (if your scarf is modifiable) and then keep checking around the neck, increasing the size slowly so that it covers the back of the neck whilst still not looking bulky in front. If the scarf has been made in pieces such as a knot in the middle I would suggest to leave it as it is to avoid making it appear too big. Editing individual parts will alter the whole shape of the scarf because you would need to increase the knot size also which will become a task. Nobody has time for that! Onward to Mesh clothing. If the item does not come with a menu then altering it will be tricky. Be sure to save your original shape as a backup. Once you are wearing your alpha and your body or skin can still be seen. I would suggest going into edit appearance and reducing your size until your own skin and body shape is not peeking through. If you are happy with your look, save this shape and rename it something you will remember for that outfit.